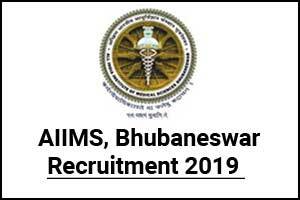 New Delhi: AIIMS Bhubaneswar has released a notification for 100 vacancies for the post of Junior Residents on Contractual Basis. The selection will be done through Walk-in-Interview. Venue Director Conference Hall, Administrative Building, AIIMS Bhubaneswar. REPORTING AT AIIMS, BHUBANESWAR: 22nd January, 2019 8.00 A.M. DOCUMENT VERIFICATION: 22nd January, 2019 08.00 A.M. – 11.00 A.M. Recruitment to the post of Junior Residents (Non-Academic) on Contractual basis for a period of 06 (six) months (maximum three terms* are allowed). Candidates who have already done 3 terms* of Junior Residency (Non-Academic) either at AIIMS or outside will not be considered. Experience in Army Services, Central Health Services, Private Nursing Homes and Private Practice will be taken as equivalent to Junior Residency (Non-Academic), if required at AIIMS, Bhubaneswar. Note: Each Term is for a period of 06(six) months. The All India Institute of Medical Sciences, Bhubaneswar is an Autonomous Body established under an Act of Parliament. As a part of its activities, the Institute is running a large hospital for training of undergraduate and postgraduate students in the various fields of Medical Sciences. Walk-in-interview for the post of Junior Residents (Non-Academic) in different specialities as indicated below in the consolidated pay of Rs. 60,000/- per month, will be held at AIIMS, Bhubaneswar. The vacancies are in the Department of Junior Resident. 1. MBBS from Institution recognised by MCI. The candidate must have completed compulsory internship and must produce internship completion certificate and registration under any state MCI. 2. Those candidates who have passed MBBS (including Internship) not earlier than 03(three) years before the start date of junior residency (Non-Academic), i.e. 31st December, 2018 will be preferred. 3. Those candidates who have already done three terms of Junior Residency anywhere will not be considered. 1. Candidates working in Govt., / Semi-Govt., PSU should submit “No Objection Certificate” from the employer. The in-service candidates will not be permitted for Interview, if no objection certificates from employer is not produced. 2. Candidates are advised to visit our website regularly to get various updates regarding the selection process from time to time. 3. All candidates completing their qualifying eligibility criteria by 31st December, 2018 shall be eligible. 4. Depending on requirement, the decision of authorities to increase/ decrease number of seats/ post shall be final. 1. The applicants have to report at AIIMS, Bhubaneswar at 8.00 AM along with the duly filled in prescribed Application Form given at Annexure-I. 2. The original certificates i.e. MBBS Degree Certificate, Internship completion certificate, Qualifying degrees (MBBS) Medical Registration Certificate, Date of Birth Certificate, Caste Certificate etc., of the Candidates who opt for the post of Junior Residents will be verified before the Walk-in-interview. 5. The NEFT details may be specified in the application Form at Sl. No. 16 by the candidates. 1. The reservation for ST/SC/OBC candidates is as per Central Govt., rules and 3% for OPH candidates (on horizontal basis). 2. For SC, ST and OBC – Certificate should be issued by authorities prescribed by Govt., of India. 10. Reservation category Certificate (OBC*/SC/ST/PH) (*Candidate should belong to non creamy layer of Central List of OBC). 11. Copy of NEFT Details in original. Candidates working in Govt. / Semi-Govt., PSU should apply through proper channel only. The in services candidates will not be permitted for Interview, without “No Objection Certificate” from the employer. The Orthopaedic Physical Handicapped (OPH) certificate should be issued by a duly constituted Medical Board of the State or Central Government Hospitals/ Instructions. All candidates, who want to avail benefit of reservation/ age relaxation/exemption of fee, should enclose a copy of certificate issued by competent authority in support of their claim for reservation exemption of fee and relaxation of age. 1. The appointment is purely on contractual basis and initially for a period of 06 months. This appointment will not vest any right to claim by the candidate for regular appointment or permanent absorption in the Institute or for continued contractual appointment which may be renewed or terminated as decided by the Institute. 2. The appointment will entitle the appointee to a remuneration as mentioned. 3. The contract will automatically expire on completion of 06 months until it is renewed upto 1½ years (3 terms) on the recommendation of the concerned HOD. The contractual appointment can be terminated at any time by the Institute. The employee can also leave the Institute by giving 01 (one) month notice or salary in lieu thereof. 4. The leave entitlement of the appointee shall be governed by the Institute’s leave rules as amended from time to time. 5. Director, AIIMS, Bhubaneswar reserves the right to cancel the advertisement at any point of time without prior notice or fill up less number of posts as advertised depending upon the institutional requirement. 6. If any candidate who joins the post and leaves/ resigns before the completion of the tenure, he/she may do so by giving one month notice as per rules or by depositing pay and allowances with the Institute for the period of which notice falls short of one month. But a candidate can’t resign / leave the post within 03 months from the date of joining. 8. This appointment is whole time and private practice of any kind is prohibited. 9. He/she will have to work in shifts and can be posted on rotation at any place including the Trauma & Emergency Medicine in the Institute. 10. He/she should also note that he/she will have to conform to the rules of discipline and conduct as applicable to the Institute employees. 11. No travelling or other allowances will be paid to the candidate for joining the post. 12. The candidate should not have been convicted by any Court of Law. 13. Canvassing in any form will render the candidate disqualified for the post. 14. If any declaration given or information furnished by the candidate proves to be false or if the candidate is found to have wilfully suppressed any material information, he/she will be liable to be removed from services and such action as the appointing authority may deem fit. 15. The decision of the Competent Authority regarding selection of the candidate will be final and no representations will be entertained in this regard. The decision of the committee shall be final and binding. 16. If selected, you have to join within 21 days of issue of the Offer of Appointment.